You fall into a dispute, try to talk it over, perhaps meet for a direct negotiation and when it fails you go into litigation. At which time you have moved into an unfamiliar world, where the decision making is out of your hands, tremendous delay and heavy costs are expected, and where inevitably there will be further damage to relationship between parties. At the end, and along the way, you would have asked your self the question – couldn’t there have been a better way to handle this problem between the two of us. Perhaps there is, now. In recent times the legal system has witnessed a revolution of sorts. With mediation firmly in place in the Court set-up, it is time to turn attention to the area of what the author calls private mediation. Mediation is strongly indicated for a wide range of business and commercial disputes. Mediation has a dynamic flexibility which enables its use at multiple stages. 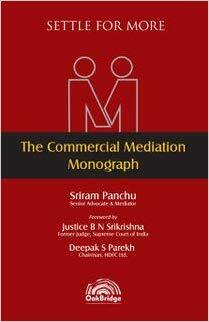 The book focuses on commercial mediation in the Indian context. It discusses (i) why mediation, how it works and when to use it; (ii) its advantages & limitations; (iii) the job of the mediator; (iv) participation by the parties to the dispute; (v) the role of lawyers & GCs; and (vi) use in different sectors. No matter what the complexity and stakes of the dispute, mediation helps. An amicable settlement is, after all, the best way to end dispute.